Eye On Sports Media: Want A Job As a PGA Tour Media Relations Rep? Fuggedaboutit! Want A Job As a PGA Tour Media Relations Rep? Fuggedaboutit! "Look at this view," said Nationwide Tour media relations representative Joe Chemycz as he looked over the 9th and 18th greens at last week's Stadion Athens Classic at UGA. "There is no better office in the world and I wouldn't trade it for anything." It was a statement as simple as this that explains why it can so hard to break into sports media relations. Next Question? 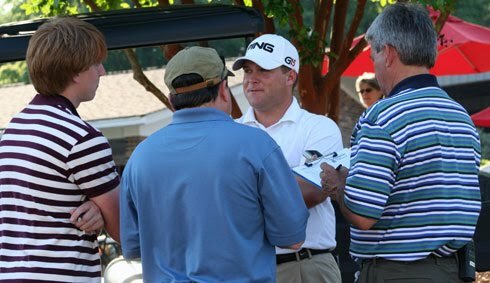 : Nationwide Tour Media Relations Rep Joe Chemycz (right) joins members of the Athens Banner Herald in interview with eventual 2010 Stadion Athens Classic at UGA runner-up Daniel Summerhays. Eye on Sports Media/2010. When asked further, Chemycz went on to say that there is just no turnover with this job at the PGA Tour. "This is the best job in the world, why would anyone want to even think about leaving it?" said Chemycz. So how did he get the job eleven years ago? "I was lucky I guess," he said. "I had sent my resume in blindly and did not hear anything for six to nine months after. Next thing you know I was called in for an interview." So keep this in mind as you try to break into the field of sports media relations. People who do these jobs love them, so vacancies do not pop up that often, When they do, you have to be ready.